Although investment trusts have seen a big leap in popularity over the last decade, they still seem to be a niche endeavour. Books about investment trusts tend to be very rare, so I was keen to read The Investment Trust Handbook. It didn’t disappoint. Jonathan Davis, the editor of The Investment Trust Handbook, is probably best known for his 1998 publication Money Makers. That book profiled a number of the UK’s leading investors, such as Jim Slater and Ian Rushbrook (of Personal Assets). I remember it fondly as I devoured investment books by the truckload at that time, and it was one of few devoted to the UK market. Davis has since produced books on Anthony Bolton and Sir John Templeton. He also runs his own website at www.independent-investor.com. 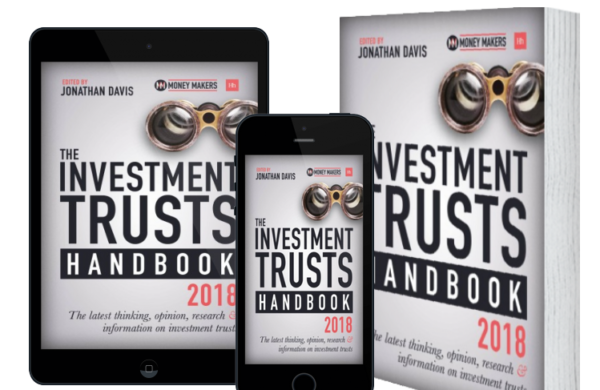 The 2018 edition of The Investment Trust Handbook was the first in what will hopefully be a long-running series. It came out almost a year ago now but the good news is that it is available a free download. In fact, it’s one of a number of free ebooks made available by Harriman House. The 2019 edition should be published on 10 December 2018. It retails at £25 although it looks as if a free, downloadable version will be available as well. The handbook is effectively split into two halves. The first has contributions from various investors and managers, while the second is a directory format. The first half is slightly shorter than the second, but there’s plenty of meat there. I’d say it’s aimed at investors who want to get their hands dirty investigating the sector as a whole. I don’t recall there being much (if anything) in the way of specific recommendations for investment trusts to buy. Neither is there any sort of rating system given. The first few chapters do a decent job of introducing investment trusts. As they are written by several people, there’s a fair amount of overlap, especially when it comes to the advantages of investment trusts. It was interesting to hear Mark Dampier’s justification of why Hargreaves Lansdown don’t recommend investment trusts (basically, due to their size, they would distort the market). (affiliate link). The investment geek in me is sorely tempted to seek out a copy. The next part of the book is a bit of a mish-mash of expert commentary and interviews. There are some not-so-subtle plugs for the book’s sponsors. But there are useful nuggets in pretty much every section and none overstay their welcome. The section on analysing investment trusts is probably my favourite section as it brings together a lot of interesting industry data. Some of the stats are readily available elsewhere but features on which managers have the most invested in their own trust and the longest-serving managers are less easy to find. I have to admit I haven’t really delved into the calendar or directory parts of the Handbook in great detail. The calendar section covers interim and final results and AGM dates. However, you have to scour it week by week to find the funds you are interested in, so it doesn’t seem that user-friendly. Something more focused on dividend payment dates would broaden its appeal I suspect. I can see myself making use of the directory section, particularly when there is a particular sector I’d like to get a high-level view of. I especially like the fact it lists how long the lead fund manager has been in situ. Overall, I’d highly recommend grabbing a free copy and I’m keen to see what the 2019 version has to offer.